I used the dough recipe from the back of my ravioli maker, because I didn’t have enough eggs handy for the recipe I really wanted to try from the Food Network website. Mound the flour in a big bowl, make a well in it, and add everything else. Use a fork to mix it all together until it makes a ball. I found I needed to add 3-4 more tablespoons of water to hold it all together, so just add a bit at a time and work it with your hands until it’s a nice ball. Flour the counter or a cutting board and knead the dough for 10 minutes or so, until it’s smooth and stretchy. The kneading was the hardest part. I really didn’t know what I was doing, except for a vague recollection of watching Anne Burrell knead pasta dough on her Food Network show a few months ago. I looked online for “how to knead pasta dough” videos and I found this one to be helpful, although my counter is a little bit too high, forcing me onto my toes to knead the dough properly, so it was an exhausting process. 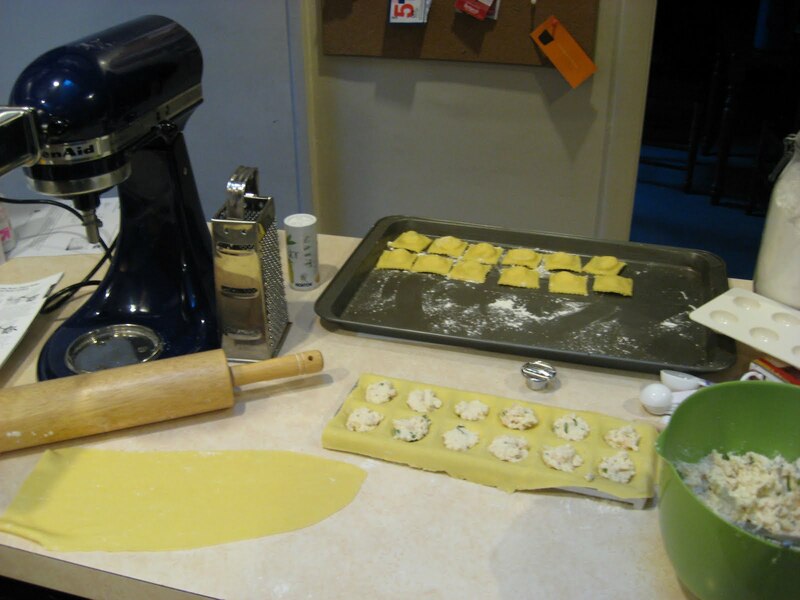 I used my KitchenAid pasta roller attachment to roll out the dough into thin sheets for my ravioli maker, and it was much easier than I expected. I worked with very small pieces so I wouldn’t have to stretch my arms out like crazy to support the rolled-out sheets, and it went well. I started on level 1 to smooth it all out, then went up one level at a time until I got to level 5, which is what the instruction book said was a good thickness for ravioli. 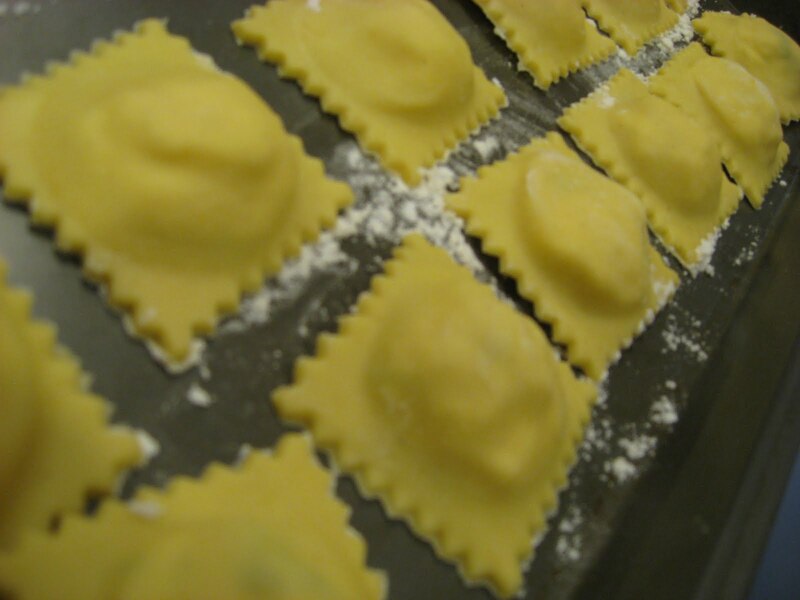 My ravioli maker looks like an ice cube tray – you lay a sheet of pasta over it, push down with the press to make pockets, fill up the pockets with your ravioli guts of choice, then lay another sheet over the top before squishing the layers together with a rolling pin. The ravioli maker has jagged ridges between the ravioli sections, and they cut through the sheets as the rolling pin goes over them, separating the squares. I found my rolling pin to be too big to get at the middle parts, so I helped things along by running the back of a spoon along the ridges. The instructions say they’re supposed to pop right out, but I had to peel them out of the mold. I had more pasta than filling, because this recipe makes a ton, so I attached the fettuccine cutter and made a bunch of fettuccine, which I will freeze for later this week. I smooshed all that together with a spoon until it was a chunky paste, and then spooned that into the ravioli mold. I tried not to overfill the mold, because that could make the ravioli pop open when I cook them. 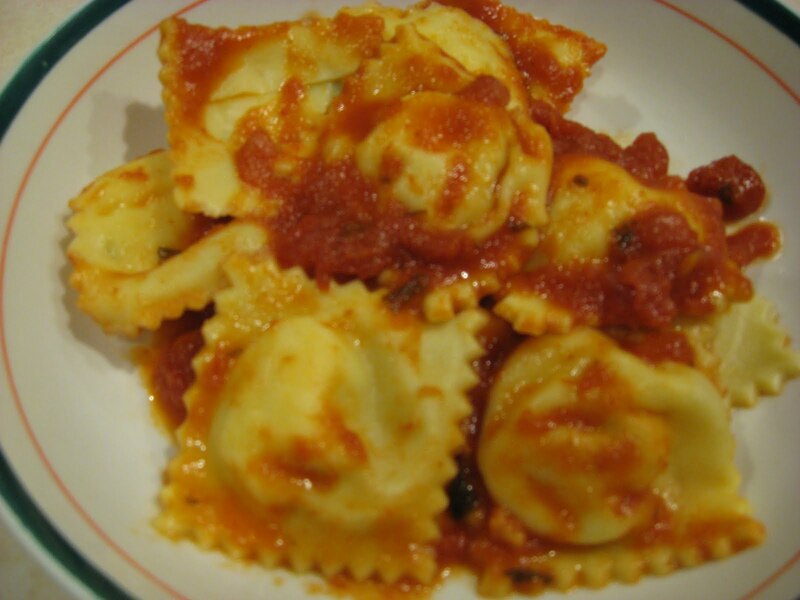 When we were ready to eat, I boiled the ravioli for about 6 minutes and added some jarred marinara sauce. I’m sure I could have come up with a better sauce option, but after three hours of work I was getting tired! I definitely want to try this again. Now that I know what I’m doing, I’m sure it’ll be a lot quicker next time. The verdict is that this is superior to most store-bought ravioli we buy, so I’ll need to learn to do this faster and freeze the ravioli for later. This entry was posted in Uncategorized on June 7, 2011 by antijen. I’ll be trying it later this week!